The end is near. Tonight’s forecast is calling for freezing temperatures. This makes me sad. Very, very sad. The only silver lining is the sweet anticipation of those soon-to-be-arriving 2012 seed catalogs. 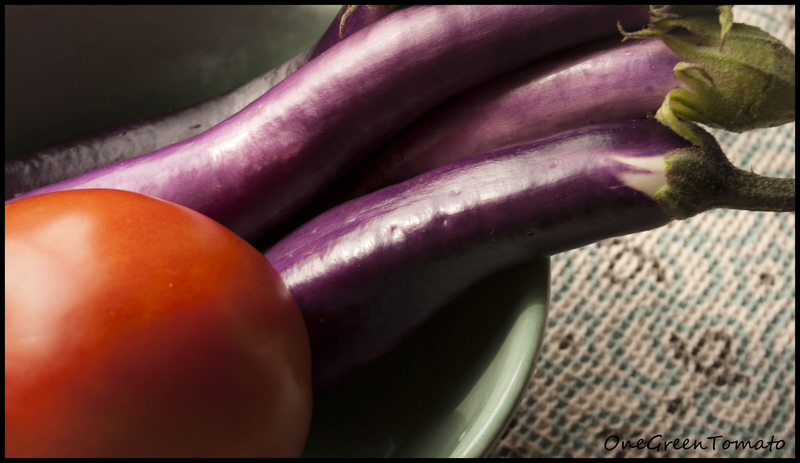 Knowing my summer-loving nightshade vegetables will not survive after tonight’s freeze, I began harvesting all the remaining peppers, eggplants and tomatoes. (I only had one tomato since late blight and flooding really took a toll on my garden this year.) Now, what does one do will all those veggies? Why one makes eggplant marinara of course! 4 purple beauty peppers, chopped – these are a smaller variety, so 2 medium peppers will work just as well. In a large sauce pot, heat olive oil over medium heat; sauté onion and garlic ’til onion is translucent, 3-5 minutes. Add canned tomatoes (along with their liquid), peppers, eggplant, tomato sauce, tomato paste, brown sugar, wine, basil, oregano, salt, and pepper. Bring to a boil, then reduce heat, cover and simmer for 30 minutes. Remove from heat and allow to cool a bit before puréeing with an immersion blender. Ladle into quart containers and freeze. I really enjoy this sauce on a bed of freshly made pasta, rice, or lentils. Typically, when it comes to applesauce, I’m a no-frills kinda gal. I cook a blend of apples, send them through the food mill, and then into the canner they go. No sugar. No spices. Just delicious, naked apples, sweetened by Mother Nature. What can I say, I like my applesauce to taste like, well, apples. This year, in keeping with tradition, I made a batch of plain-jane applesauce. Then, I made a batch of knock-your-socks-off awesomesause. Yes, you read that right, awesomesauce. It. Is. Dessert. Worthy. Core unpeeled apples and place them in a large stainless steel pot with about an inch of water. Cook apples over med-high heat (stirring often) ’til apples are soft, about 20 minutes. Run cooked apples through a food mill to remove skins. Return sauce to a clean pot. 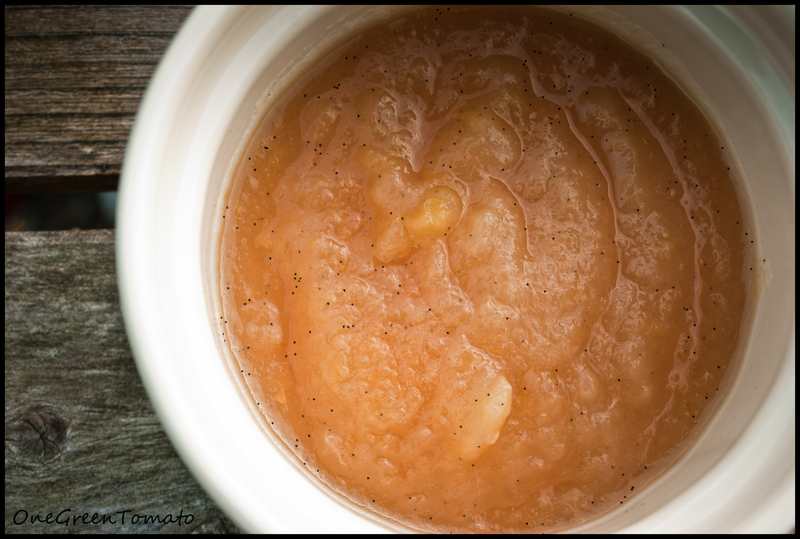 If you want unsweetened applesauce, it is at this time you will ladle into hot, clean jars and process in a boiling-water bath: 15 minutes for pints and 20 minutes for quarts. If you have a mix of jar sizes, process them all for the longest time. Split vanilla bean lengthwise; using the back of your knife, scrape out the seeds. Add seeds and vanilla bean to the applesauce along with vanilla extract and gently simmer on med-low heat for 15 minutes. Stir often. Add sugar, maple syrup, and lemon juice, cook an additional 10 minutes. Remove vanilla bean and ladle applesauce into hot, clean jars and process in a boiling-water bath for 20 minutes. Yields 7 pints. Images and content copyright © 2009-2011 Danielle R Limoge. Recipe adapted from Tigress in a Jam and Toronto Tasting Notes. 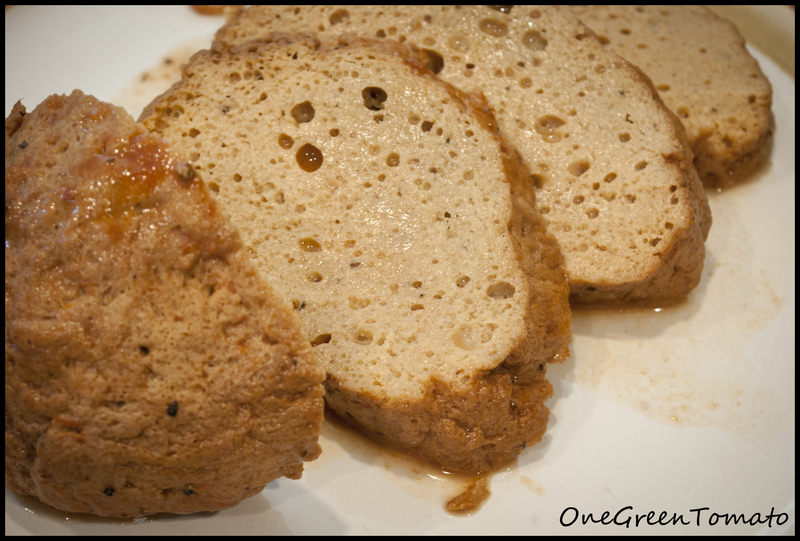 Seitan (pronounced say-tan), also known as “wheat meat” or “wheat gluten” is an excellent source of protein. Although not as well-known as tofu, seitan’s popularity is quickly on the rise due to its ability to take on both the taste and texture of meat. There are many ways to prepare, flavor, and cook seitan; honestly, I don’t think I’ve ever made it the same way twice! My new favorite is the crock pot method! Not only is this a “fix and forget” recipe, but it also produces the best “meat” texture due to a long, slow simmer! Boiled seitan (when I make it) tends to produce a spongy texture, which I have a hard time swallowing since it makes my teeth squeak. Those with an aversion to textures know what I am talking about! It makes me squirmy just thinking about it! To make the seitan, using a medium bowl, whisk together dry ingredients; in a small bowl, whisk together wet ingredients. Add wet to dry and mix until a stiff dough forms. Knead for several minutes until dough becomes elastic. Set aside so dough may rest. Place all simmering ingredients into the crock pot, stir well, then set the temperature to high. Cut seitan into two equal portions and place in the slow-cooker. Go do something else for 5 hours while the seitan cooks. After 5 hours have passed, remove one (or both) portion(s) and slice. Heat oven to 375°F. Pour some breadcrumbs on a plate, and in a small bowl make a slurry with the cornstarch and water. 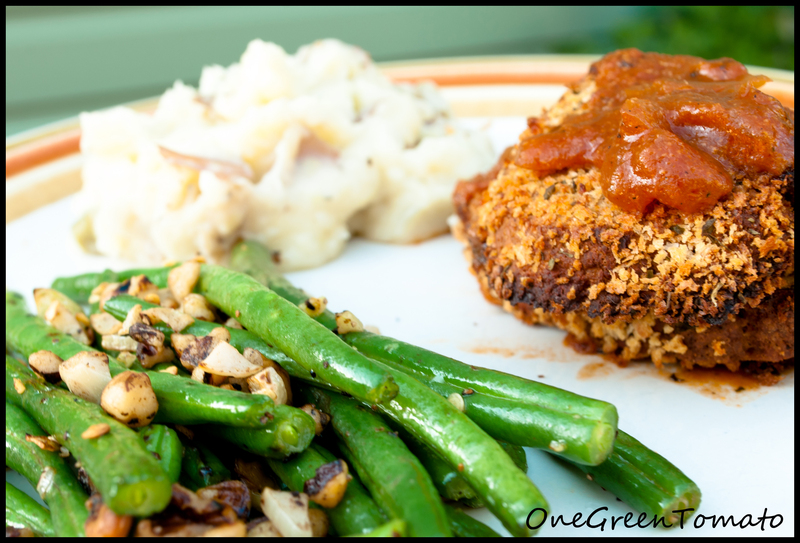 Dip seitan cutlets into the cornstarch mix, then on the breadcrumbs, coating each side. Transfer breaded cutlets on a parchment-lined baking sheet. Once all the cutlets are laid out on the baking sheet, spray them with a bit of olive oil. Bake for 30 minutes, flipping halfway, spraying again with olive oil. When the seitan goes into the oven, place your chopped potatoes in a med-large pot and cover with several inches of water. Bring to a boil, then reduce to a steady simmer, cooking for 20 minutes. Drain potatoes and place back into the pot. Mash potatoes with a potato masher and add several tbsp of butter. I probably used three; add enough milk to make them creamy. I didn’t measure, so if I had to guess, maybe 3/4 cup? Add salted herbs and pepper to taste. When your potatoes are simmering, ladle 2-1/2 cups simmering liquid into a large sauté pan. Try to scoop up as many onions as possible. Bring to a steady simmer and cook for 10-15 minutes to reduce a bit, transfer to a heat-safe bowl. In the same pan, melt 2 tbsp butter and stir in the 2 tbsp flour. Return the reduced liquid back to the pan and stir well until thickened. This will be the last thing you make because it takes literally 3 minutes. Place green beans and garlic in a hot (but not too hot) pan with a bit of olive oil. Keep them moving so they do not burn. After about a minute add walnuts; sprinkle on paprika, pepper flakes, and salt. Cook for an additional 1-2 minutes, or until green beans are crisp-tender. If you cooked only one of the seitan portions (which is what I did) the other one should be refrigerated in the remaining simmering liquid. Cook within 4 days. Images and content copyright © 2009-2011 Danielle R Limoge. Recipe adapted from the Vegalicious Family Kitchen. Several weeks ago, I wrote a post about sun-dried tomatoes. I mentioned how they can be packed in oil and safely stored in the fridge. Well, after several weeks of eying them up, ever-so-safely tucked away between the pickles and garden-fresh produce, the time had come for me to start putting those babies to good use! 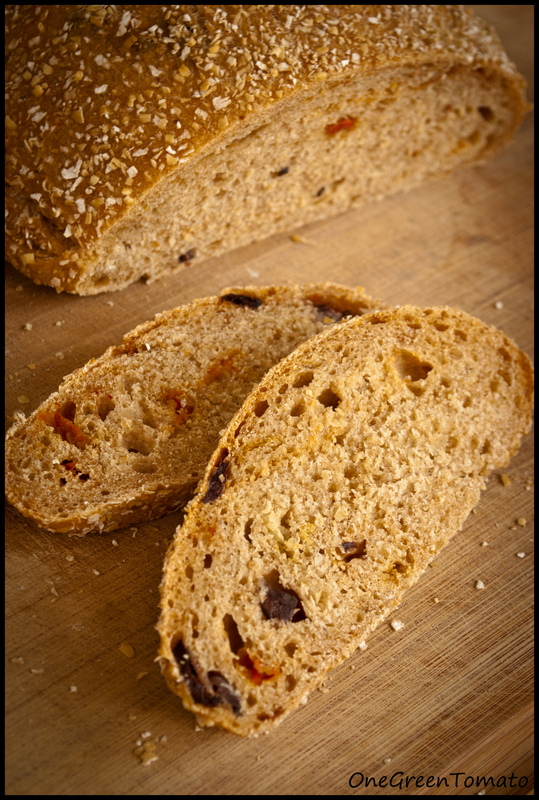 Sun-dried Tomato and Kalamata Olive Bread – makes 2 small loaves or one large loaf. Combine flour, salt, and yeast in a large bowl; add water, oil, olives, and tomatoes. Gently mix ingredients until a sticky dough forms. Turn dough out on a well-floured surface; knead until smooth and slightly elastic for about 10 minutes. Wash and oil the bowl you mixed the dough in and return dough to bowl. Cover and place in a warm, draft-free area, and allow dough to rise until doubled in size, 45-90 minutes. Gently press your finger tips into the dough to deflate; place dough on a generously floured surface and knead again. Place dough back in bowl and allow to rise another 30-60 minutes. Repeat the knead and rise cycle up to four times; by doing so it will improve the texture and flavor. After the final knead, divide dough into two equal pieces, or keep whole for one large loaf. Sprinkle oat bran onto your work surface and shape dough into loaves, be sure to coat all sides of the dough. Allow dough to rest, covered, for 10-15 minutes. Place a baking stone on the middle oven rack and a large water-filled baking dish on the very bottom rack; heat oven to 500°F. Place loaves on stone and bake for 10 minutes, then turn heat down to 400°F if the crust looks very pale, 350°F if the crust is browning, or 325°F if the crust is browning too quickly. Bake until the loaves are crusty and brown and sound hollow when you tap them: in total, about 30-40 minutes. Allow loaves to cool on a wire rack before slicing. If you will be serving them with oil for dipping you can tear them when cool to the touch. Ketchup and fries? Yes, please! While flipping pages contemplating recipes, I came across one for catsup. I find ketchup (or catsup) to be a take it or leave it condiment. I’m just not a huge fan. In college, I dated a guy who put it on everything, and I mean EVERYTHING. Gross. Honestly, I find it to be too sweet and lacking in, oh, I don’t know, maybe TOMATO flavor! I thought the time had come for a little ketchup redemption, especially since the first listed ingredient would not be HFC! In a small saucepan combine vinegar, cinnamon stick, cloves, and celery seed. Bring to a boil, remove from heat; transfer to a bowl and set aside. Wash tomatoes. Remove stem ends and cores; cut the tomatoes into quarters and place into a colander to drain. You can discard the liquid or keep it for cooking purposes, which is what I did. Place tomatoes in a large stainless steel pot, add onion and ground red pepper; bring to a boil, cook uncovered, stirring often for 15 minutes. Press tomato mixture through a food mill or sieve; discard seeds and skins. Return pureed tomato mixture to pot, stir in brown sugar. Heat to boiling; reduce heat. Boil gently, uncovered, for 1-1/2 to 2 hours, or until reduced by half, stirring occasionally. Strain vinegar mixture into tomato mixture; discard spices. Add lemon juice and salt. Simmer uncovered about 30 minutes or ’til desired consistency is achieved. After I did the final cook-down, my mixture was still too runny for ketchup. If I continued cooking, I would have ended up with one half-pint, so I added 1/4 cup cook-type sure jell. Because sure jell tends to clump when added without mixing with sugar, I used my immersion blender to blend everything into a smooth consistency. I continued cooking on med-low heat ’til the sure jell thickened, about 5 minutes. Ladle ketchup into hot, sterile half-pint jars, leaving 1/8 headspace. Wipe rims; adjust two-piece lids to fingertip-tight and process in a boiling-water bath for 15 minutes. Remove jars from canner and cool on wire racks, undisturbed, for 12-24 hours. Yields 4 half-pints. Preheat oven to 350°F. *KITCHEN SHORTCUT* Using an apple slicer/corer, cut potatoes into wedges, slice the “potato core” in half, lengthwise. 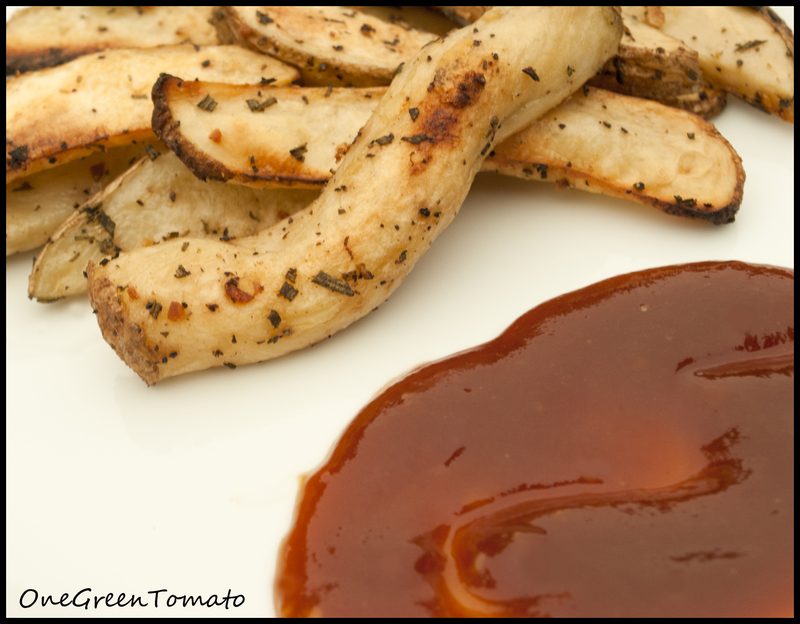 Place potato wedges, garlic, and rosemary into a medium bowl and drizzle on a bit of olive oil. Using your hands, lightly toss to coat evenly; sprinkle on salt and pepper and gently toss again. Lightly grease a 4-sided baking sheet (or baking dish with olive oil), arrange potato wedges in a single-layer, and bake for one hour, turning half way through. **The USDA/NCHFP’s guidelines are constantly evolving due to repetitive laboratory testing. What were once acceptable canning practices, like using flour as a thickening agent or adding dairy products to pre-canned recipes, are no longer considered safe. If you do use an older recipe, make sure all ingredients and directions are compatible with current acceptable canning procedures. If you are unsure or have a question, be sure to check with your local extension office. Remember, safety first! Images and content copyright © 2009-2011 Danielle R Limoge. Recipe adapted from Better Homes and Garden Presents: America’s All Time Favorite Canning & Preserving Recipes. As hot and humid Summer begins transitioning into cool and crisp Autumn, I’ve once again found myself replacing my usual light and fruity go-to breakfast with a warm bowl of steel-cut oats. While my recipe is basic, the add-in possibilities are endless: fruit, spices, nuts, jam! Typically, I prepare a batch at the start of a week, and keep the “naked oats” in the fridge. Then, each morning I fill my bowl and dress according to that day’s desired flavor! This way, when I’m heating the last bowl, I’ve yet to grow tired of eating the same thing all week! In a skillet, toast oats in a bit of butter over med-high heat for several minutes; stir constantly so oats do not burn. In a medium pot bring water to a boil and add the oats with a pinch of salt. Boil for several minutes, reduce to a simmer, and cook for approximately 20-25 minutes. Do not stir them during this time: as long as you keep the heat on low, they should not burn. Once most of the liquid has been absorbed, add the milk, and mix well. If any oats have stuck to the bottom of the pot, they will begin to lift at this time. Remove oats from heat and portion into bowls. It is at this time that I begin adding the “good stuff”! When working with a bowl of refrigerated “naked oats”, adding a splash of milk after heating will bring them back to their initial-cook consistency! 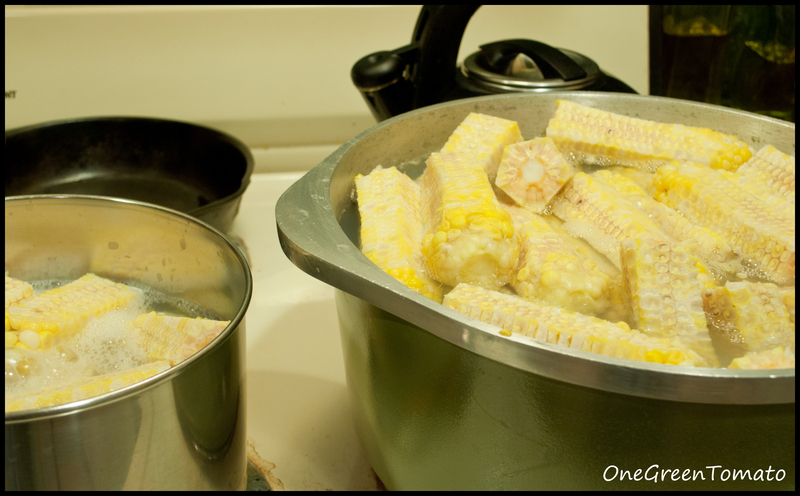 In Thursday’s post I explained how to freeze sweet corn; today, I’m going to share with you how to make corn cob jelly. Yes, you read that right, you can make jelly from corn cobs! Believe it or not, it tastes really good, the flavor is somewhat reminiscent of honey. Boil hard for 30 minutes; the longer you boil it down the more concentrated flavor you will have. I ended up with 5 cups corn-liquid. Remove from heat and strain the liquid through a jelly bag or cheese cloth, or leave the corn bits in the liquid, that is what I did. 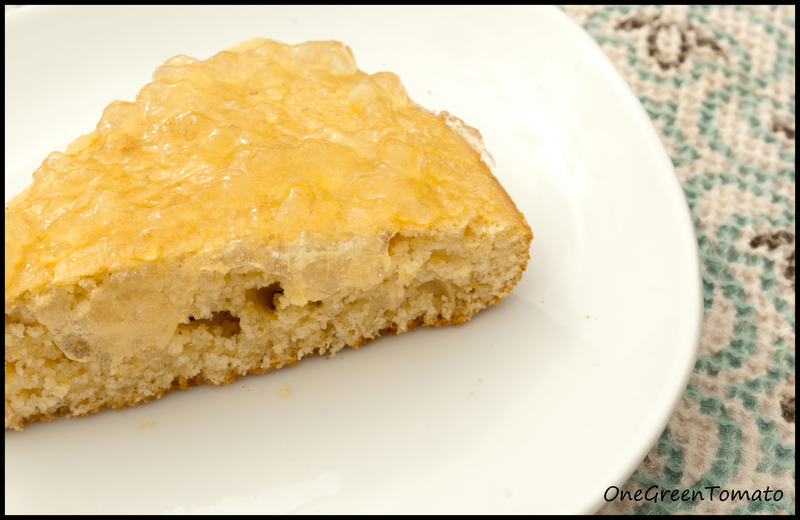 Corn cob jelly on warm cornbread. This year I grew zucchini patisson strie, which are beautifully striped scalloped squash. When fully grown their skins are quite tough, so it is recommended that you eat them when they are small; however, their bold colors do not develop ’til just before maturity. Do you see where I am going with this? Having grown them specifically for their aesthetic qualities, I needed to find a way to enjoy them when fully grown. 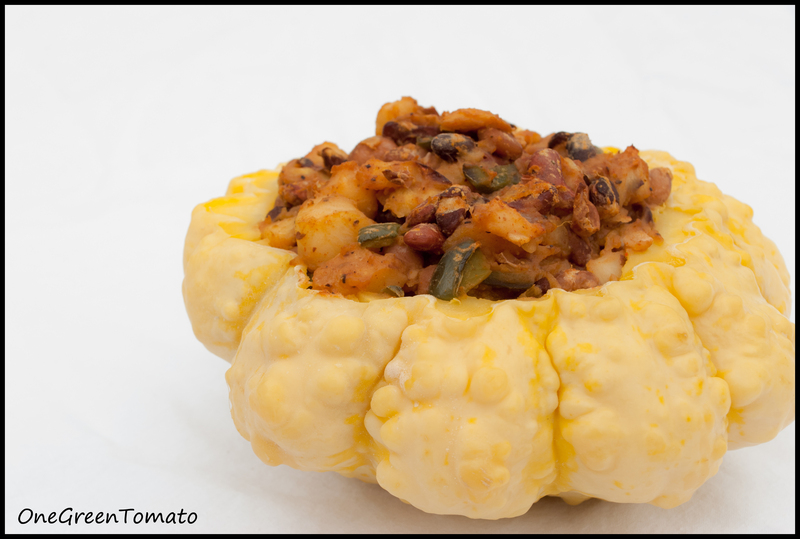 I’ve seen several recipes for stuffed winter squash, so I thought I would put my spin on it with this tough-skinned cousin! For the Cajun seasoning I used equal parts salt, pepper, oregano, red pepper (hot), garlic powder, and chili powder to one part smoked paprika. 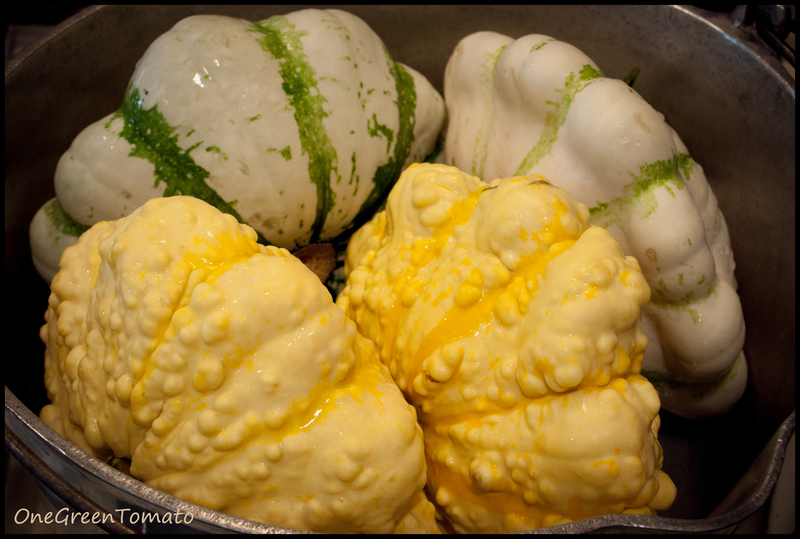 Place squash in a very large pot with about an inch of water, cover and bring to a boil. I had to use foil to cover mine. Cook for about 8-10 minutes or until squash skins can be pierced with a fork. Remove from pot and allow to cool so that you may touch them. Once squash has cooled to the touch, slice off the top and scoop out seeds. With an ice cream scoop carefully remove cooked squash leaving approximately 1/4-inch flesh on the inside. Chop the cooked squash into chunks and set aside. In a large pot sauté onion, celery, and pepper over med-high heat for about 5 minutes; add garlic, squash, and seasonings, stir well to incorporate and cook another 2-3 minutes. 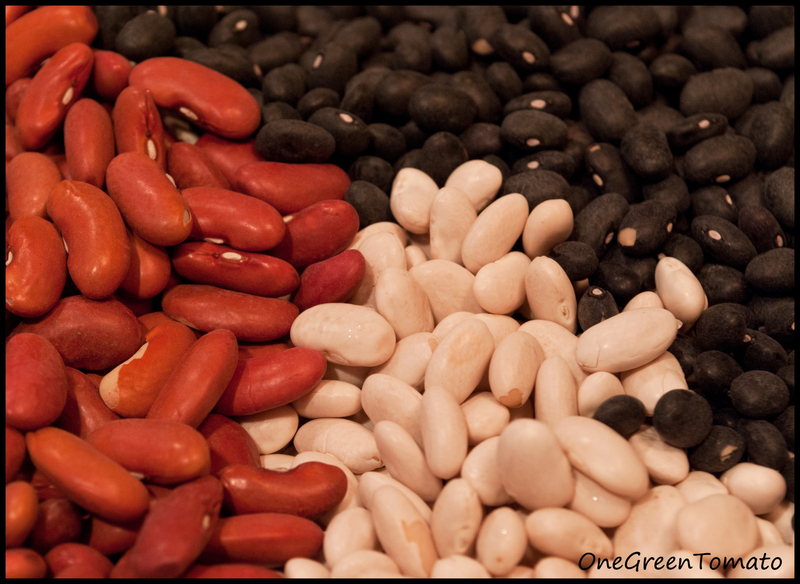 Reduce heat to low and add beans, cook for an additional 5 minutes. 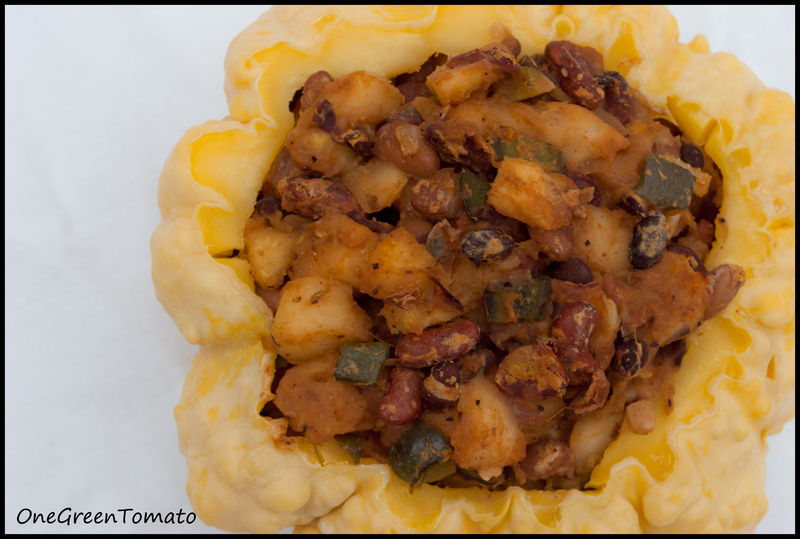 Place the squash shells into a large baking dish and stuff them with bean mixture. Don’t be afraid to pack them full! If any stuffing is left over it can be piled into the baking dish between the shells. Bake stuffed squash for 20 minutes, or until the tops start to brown. Since I have so many of these squash, I’m going to make more of the stuffing and use it as a burrito filling. I’ll just add a bit of cheese to each tortilla, roll them up, and wrap each one individually and then freeze them. This way when I am short on time I can just defrost and reheat! Last week/end I managed to escape the harvest and sneak in a much-needed vacation! While on my travels I picked up a few treasures, one being a 1944 edition of The Good Housekeeping Cook Book. What makes this vintage book a real gem are all the hand-written notes tucked within the pages! The previous owner had the most beautiful penmanship! 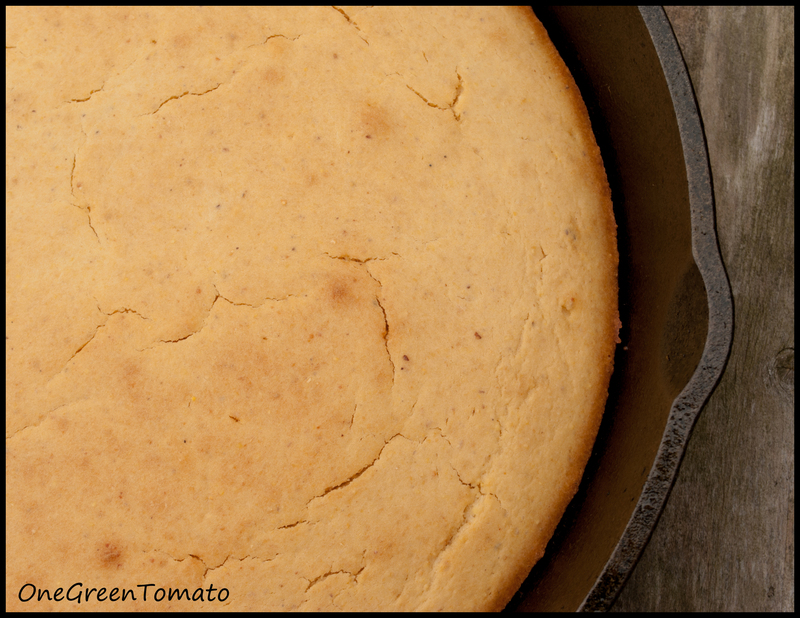 The first recipe I tried was for cornbread. While this is not my favorite cornbread, it was still quite good, and with all the jams I’ve been making, it’s nice to switch up my spreading surface! 1-1/2 cups sifted all-purpose flour **A listed alternative to the a.p. was to use 2 cups minus 2 tbsp sifted cake flour, which is what I did. 1 cup milk **I used 1/3 cup dry milk reconstituted with 1 cup water. Sift together flour, corn meal, baking powder, sugar, and salt. Combine milk, egg, and shortening. Turn liquid ingredients into dry ingredients all at once, stirring quickly and vigorously until mixture has a lumpy appearance, but no longer. Pour into a well-seasoned 10″ cast iron skillet and bake at 425°F in a preheated oven for 25-30 minutes, or until the top is lightly browned. Serve warm. For me, peach butter is the perfect partner for pancakes. 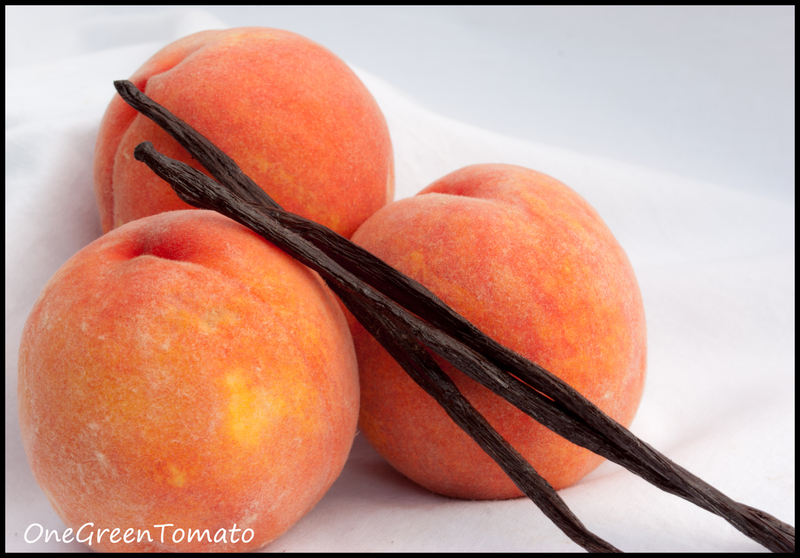 No need for butter, or maple syrup, or honey: just velvety smooth peach butter will do just fine! This year I decided to switch things up a bit by adding a vanilla bean into the mix. I’m so glad I did because it takes this fruit spread to an entirely new level! Place chopped peaches in a crock pot and mash with a potato masher to release juice. Set heat to high and cook for an hour with the lid vented; resting the lid on a long wooden spoon works well. Add sugar, stir, and set heat to low. Continue cooking an additional 6 hours (with the lid propped open allowing steam to escape). Once your fruit has cooked down, add lemon juice and the seeds from the vanilla bean. Using an immersion blender, puree mixture into a creamy consistency. Ladle into hot, clean, half-pint jars and remove air bubbles; wipe rims, add two piece lids and process in a boiling-water bath for 10 minutes, or for as long as your altitude requires.